Say what you will about Star Wars: Battlefront; EA’s first considerable foray into modern Star Wars video games truly captured the aesthetic and audible experiences of the original trilogy. They played it safe, not stepping on anyone’s toes and not exploring too far beyond the reaches of the beloved original era. Ultimately, however, it did not deliver the expansive new narrative fans were clamoring for in the medium. Amy Hennig’s untitled Star Wars game with Visceral was a distant speck on the horizon, and has yet to come fully into view. Needless to say, there has been a void in the story-driven Star Wars interactive experiences as of late. With that said, the wait has been shortened with a slightly predictable, but also pleasant surprise. It sure is better late than never. It is no secret that EA’s follow-up to their multiplayer-centric Star Wars: Battlefront will have a single player campaign boasting an original narrative set in the fertile thirty years between Return of the Jedi and The Force Awakens. In fact, the game was announced at Star Wars Celebration Orlando this past April with great emphasis on the offline experience that DICE, EA Motive and Criterion are looking to deliver. 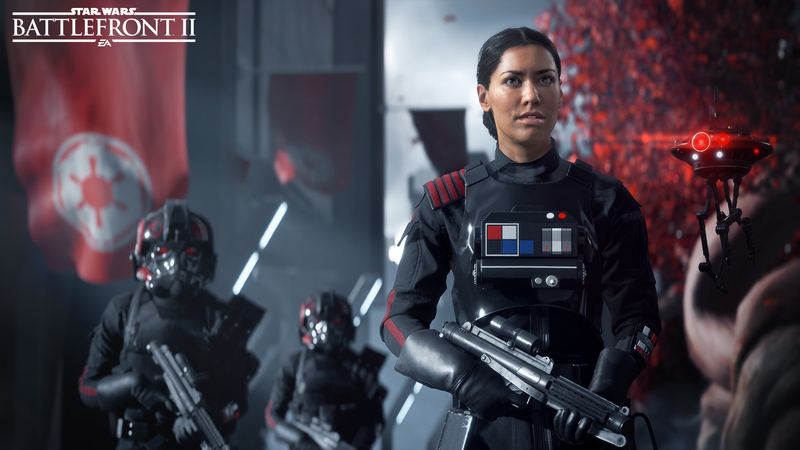 Aside from some minor details about the next installment’s multiplayer gameplay, the SWCO reveal leaned heavily into the introduction of its protagonist, Imperial Special Forces commander Iden Versio (Janina Gavankar) of Inferno Squadron and her story. The current Star Wars canon has its fair share of strong protagonists; however, Iden Versio is no ordinary Star Wars hero. 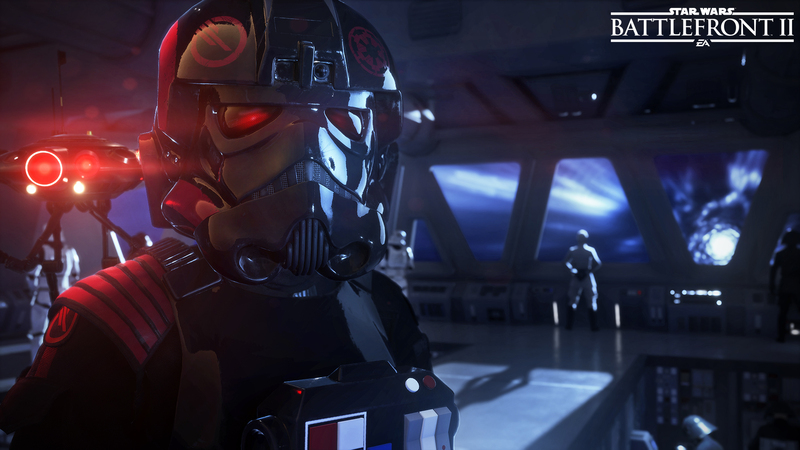 As an imperial soldier, and a very indoctrinated one at that, Versio will provide players with a perspective unlike any brave rebel or sinister Imperial has before. Versio is a true believer, and she has every reason to be. While Star Wars fans have bared witness to the atrocities committed by the Empire in past tales, Versio grew up on Vardos, an Imperial utopia. After the sudden death of the Emperor and Darth Vader aboard the Death Star II in orbit over the Forest Moon of Endor, Versio appears to receive her final orders from Palpatine via a Sentinel droid first seen in the Shattered Empire limited comic series. Versio and her Inferno Squadron special forces troops vow to avenge the Emperor and to eliminate those responsible for the destruction of the Death Star II and the core of the Empire. Whether or not Inferno Squadron will carry a personable atmosphere and bond that players can latch onto, it is apparent that this band of Imperial soldiers will represent a corner of the Star Wars canon that has yet to be explored in great detail. Battlefront II is a suitable vessel to deliver that experience without retreading old storylines to less success. It will achieve this if it does not fall into imitation, and it seems safe to say that Inferno Squadron will be an entirely different band of heroes. Star Wars has always been viewed as the story of good versus evil, the Rebellion versus the Galactic Empire, hope versus oppression. These similar concepts will likely remain in Battlefront II’s story, however they will be viewed with a different lens, one that we recently saw in Rogue One: A Star Wars Story. The film explored new thematic and canonical territory with its portrayal of rebels as extreme, violent and morally unstable insurgents. Saw Gerrera’s Partisans and a few of the Rebel Alliance’s own operatives blurred the lines to justify their own actions, allowing fans to experience a new side to the good guys. This grey area will look a little different in Battlefront II. Coming in just under a year following this new vision, Battlefront II’s protagonist will open the world to an ideology that has always been considered evil. The rule of the Galactic Empire is a metaphorical Third Reich, something that remains a sensitive subject today. Nazi Germany has been portrayed countless times in pop culture and entertainment media, although their most sympathetic representatives have more often been German soldiers, not Nazi officers and party leaders. Battlefront II is effectively introducing the equivalent of an SS officer with Iden Versio and the Inferno Squadron. They are a tailor-made fighting force with special training and a deep devotion to the ideals of the Empire. Even if players do not share these beliefs, they will now be able to understand why so many fought for the Emperor. Growing up on Vardos, shut out from the oppressive nature of the Empire abroad and educated under the triumphant rule that the Empire upheld shaped Versio in a way no other Star Wars hero has been before. As a video game, this story will force players to place themselves in their black armoured boots and dive headfirst into this untouched corner of the galaxy, for better or worse. The biggest weapon in Battlefront II’s arsenal may be its head writer Walt Williams. Most notably, Williams wrote the third-person shooter Spec Ops: The Line. The game was applauded by critics for its compelling narrative and exploration of the psychological elements of war. For those who have not, Spec Ops: The Line is well worth playing despite its average gameplay, simply because it forces the player to consider their actions rather than trigger the next big set piece. While it would be foolish to suggest Battlefront II will be an updated Spec Ops: The Line wrapped in a Star Wars skin, Williams’ story about moral ambiguity and indoctrination is definitely front of mind. Star Wars could benefit from a Full Metal Jacket-line narrative, or a more in-depth dissection of the mind of a soldier. For fans interested in learning more about Iden Versio and Inferno Squadron, Christie Golden’s book, Battlefront II: Inferno Squadron, will delve into the thoughts and actions of the special forces unit between the events of A New Hope and The Empire Strikes Back. Interestingly enough, the book serves as both a prequel to the events of the game and pseudo-sequel to those of Rogue One. Readers will discover Versio and Inferno Squadron as they hunt down what remains of Saw Gerrera’s extremist Partisans in retaliation for the Death Star’s destruction. Perhaps the contrast of Inferno Squadron’s beliefs and the Partisan’s immoral tactics will help plant the seed for what will come in Battlefront II. Come time for the game’s release, Iden Versio may prove to be one of the more interesting characters in the modern Star Wars canon, expressing a strong-willed devotion to the Galactic Empire with less of the inherent sinister intentions present in most other depictions. Next articleJungleDrums: Episode 16 – Intel i9, ASUS X399 Zenith, Crazy Taxi, and more!